There are a lot of choices in commercial stamps (I have purchased many), but I’m finding it more fun to make my own for printing on fabric. The book, Carve Stamp Play by Julie Fei-Fan Balzer is very helpful. I use ECO Printing Plates for my rubber block and linoleum cutter tools. 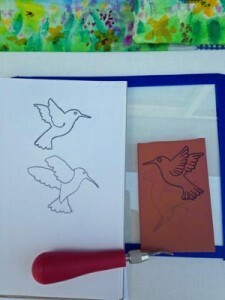 To transfer the design to the block, draw the design on paper with a pencil, then flip the paper onto the block and rub. It will be in reverse – remember that if you are going to do any words. With a ballpoint pen draw over the pencil line that was transferred. Mark the area to be carved out (or stay in), just to keep you on track while carving. With the smallest carving tool, carve a “mote” around your design. Carve away extra rubber & make a test print on paper. Now for stamping on fabric. After you are happy with the test print, it’s time to get out the fabric. With Setacolor Fabric Paint by Pebeo, when stamping the paint is used full strength. Ink up the stamp with a foam brush or stamp pad, then stamp on fabric. 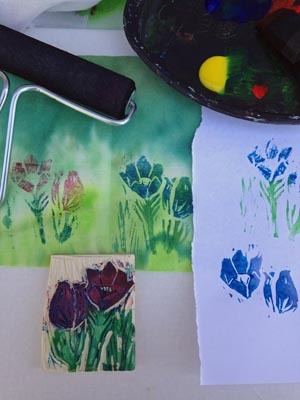 You can also lay the fabric on the stamp and use a brayer to make the design. Not into carving? Once you start looking you will see potential stamps everywhere – pears, the end of a stalk of celery, packing material, leaves, etc.